Happy Friday. Glad you had a chance to stop by. The lovely talented Angela, over @ Sketch Frenzy Friday has a wonderfully simple sketch for you to use, and play along with us. When I first saw this sketch, the first thing that came to me, was a wrapped package. And so, I almost created a card with that look. But, then, I wanted to make something fresh, new, different. 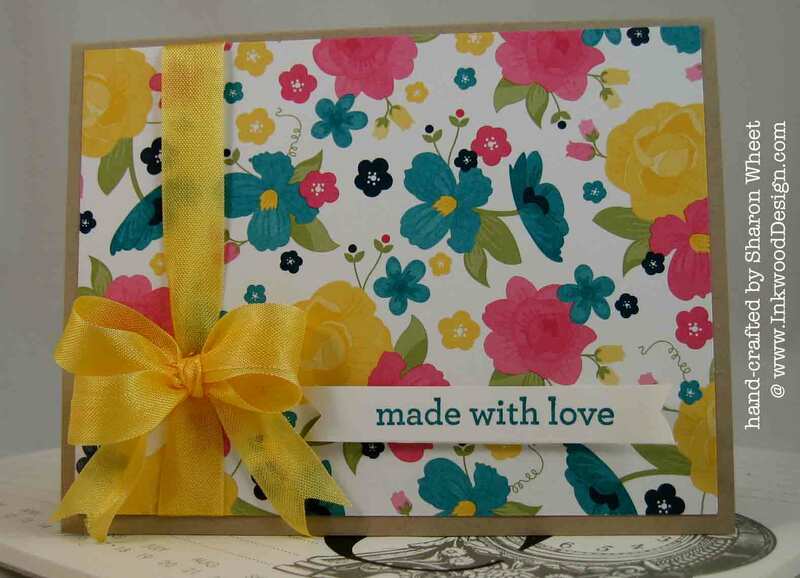 I used crumb cake cardstock, as my card base. But, I just love this pretty, bright, cheerful floral pattern paper: Gingham Garden DSP. I wrapped some daffodil delight seam binding around the main panel, and tied the seam binding into a multi-loop bow. I made a simple sentiment banner from whisper white cardstock. I stamped the sentiment using the Kind & Cozy stamp set. I inked the sentiment in Island Indigo classic ink. I used a square punch to create the banner end. I adhered the sentiment banner to the card with dimensions. Now, it's your turn! Let's see what you create with this week's sketch @ SFF! Labels: Gingham Garden DSP, Kind and Cozy, seam binding, SFF, sketch.